How do we monitor a broken sensor and why messure oxygen? Oxygen sensors are really important. Oxygen sensors play an important role in emissions because they monitor fuel consumption - they’re used to determine your car's proper fuel mixture to ensure optimal performance and fuel economy. 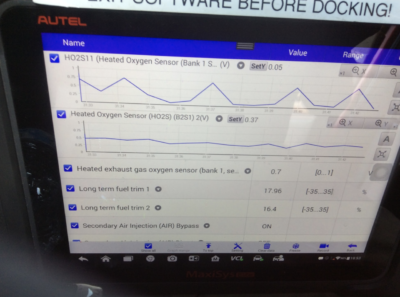 There's a few oxygen sensors on your car. Sensors that use zirconia are the most accurate. The particular one we are looking at is a Wideband zirconia oxygen sensor. Vehicles with oxygen sensor problems, such as one that is broken, can set off other trouble codes. In this example, the vehicle had an intermittent sensor problem. In the pictures below, you can see we were able to duplicate the problem after certain driving conditions. Sensor B1 S1 looks good. Sensor B2 S1 was flatlined when it acts up. Oxygen sensors are also used to monitor catalytic converters, which reduce emissions in most modern cars. A working sensor ensures that your catalytic converter is doing its job to reduce your environmental impact. Most modern cars have two sensors. The front one ensures your car is fuel efficient and the back works to monitor emissions. So wait, why detect oxygen? If we have perfect combustion, we have no oxygen left over. If we have oxygen leftover, that means we have too much of something. This translates into too much oxygen in the engine. If the back sensor detects oxygen, we're not burning emissions in the catalytic converter, which would reduce the amount of oxygen left over. The catalytic converter acts as a kiln for emissions, working to combine molecules and reduce the expulsion of harmful chemical compounds. 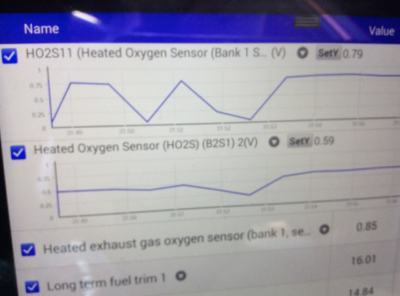 With these sensors, the car can monitor whether the catalytic converter is working.